ELI Vocabulary in Pictures English - with audio and digital activities Colorful, up-to-date and easy to use, the ELI Vocabulary in Pictures is the ideal tool for learning or revising basic English vocabulary. The captivating situations, the immediate picture-word association, plus the audio recordings and fun digital activities, engage young...more..
English from A to Z + CD audio - Alphabetic Picture Dictionary - 1000 words plus games and activities Illustrated situational and structural dictionary For Primary School Aims Learn basic English vocabulary and structures via fun cartoon illustrations. 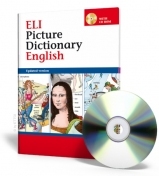 The Bang family and their friends involve...more..
ELI Picture Dictionary English + CD ROM - a dictionary for students at varying learning levels for Secondary School Aims: Enrich students English vocabulary with more than 1000 words. Structure: 43 illustrated theme pages introduce well known topics such as at home, family, school and work, as well as up-to-date and specific topics such as the...more..
ELI Picture Dictionary English Junior For primary school students. An amusing way to learn more than 1000 English words and expressions. Marvin the Mouse guides young readers through 36 splendidly illustrated thematic drawings introducing vocabulary for home, school, and other elements of children's daily...more..
ELI Picture Dictionary English Junior Activity Book The Activity book is packed full of games and makes memorising words from the ELI Picture Dictionary English Junior easy and fun. The answers to the games make memorisation and self-learning easier and effective. more..
Passport Junior Inglese-Italiano / Italiano-Inglese + CD-ROM -aprox. 12,000 entries (English-Italian) - 500 pages -index of italian words with their english translations - 100 pages -word division -pronunciation transcriptions (International Phonetic Alphabet) -illustrations -topic-based glossaries -irregular...more..
Business Dizionario Commerciale -accounting -administration -commerce -law -politics -economics -finance -banking -transport -insurance -internet -e-business -marketink -advertising 25.000 lemmi 623 pages 7,5x11,2cm, plastic cover ISBN...more..
Agriculture Dictionary is a English to Italian and Italian to English dictionary of words related to agriculture . It covers such topics as: crop and livestock farming, nutrition, the enviroment, food transformation, botany and others. The dictionary contains dozens of detailed thematic illustrations, such as a description of the construction of plants and animals, the construction of...more..
English and American proverbs is a set of nearly 400 proverbs and maxims typical for english and american cultural circles. It contains historical introduction in both Italian and English and Italian translations and debriefings of all entries. Accessory alphabetical index of content is also very usable. 10x16,8cm 160 pages ISBN 9788849304763 La...more..
English pop, slang & taboo words is English to Italian dictoionary of colloquial language, slang expressions and taboo words. Contains ilustrations and full english index of entries. 10x16,8cm 176 pages ISBN 9788849304954 La Spiga Modern Languages more.. Play with Idioms is a mini-lexicon of English and American idioms, explicated in Italian. The book has bilingual, English-Italian introdution. 10x16,8cm 160 pages ISBN 9788849304343 La Spiga modern Languages more..